One of the great things about working in a college library is that student research projects often send us digging into parts of the collections we probably wouldn’t have explored otherwise. Earlier this week I talked with a vision-impaired student who had consulted our twentieth-century braille edition of Worsdworth in the past. The published bibliography, The Amherst Wordsworth Collection, includes entries for two other editions of Wordsworth produced for blind readers in the nineteenth century. Matthew Arnold’s edition of Wordsworth in braille. I recently processed a single box collection of correspondence from Viola Roseboro’, a fiction editor and author at the turn of the 20th century, to her friend Gertrude Hall Brownell, poet and author. The correspondence spans an eight year period (1936-1944) toward the end of Roseboro’s life. This small collection contains primarily one-sided correspondence from Viola Roseboro’ to Gertrude Hall Brownell, with the occasional enclosed letter by Gertrude Hall Brownell or other correspondent, including a single Willa Cather letter. The correspondence reflects Roseboro’s views on literature, politics, current events, shared acquaintances, her health, finances, and living arrangements, and her lifetime love of Shakespeare. This collection gives a glimpse of a close friendship between two women in early 20th century New York. Viola Roseboro’ was born in Pulaski, Tennessee in 1858, daughter of the Reverend S.R. Roseboro’ and Martha Colyar. Roseboro’ attended Fairmont College in Monteagle, TN and worked as a stage actress before settling in New York around 1882 to begin a career in newspapers and magazines as a freelance writer and reader. Roseboro’ joined the staff of McClure’s Magazine, a monthly periodical publishing literary and political content, as a manuscript reader in 1893 before becoming the fiction editor for the magazine. As editor, Roseboro’ was known for her talent in selecting and publishing unknown authors, such as O. Henry, Jack London, and Will Cather. Roseboro’s first collection of short stories, “Old Ways and New” was published in 1892. “The Joyous Heart,” a novel, was published in 1903, followed by another collection of short stories, “Players and Vagabonds,” published in 1904. “Storms of Youth,” Roseboro’s final novel, was published in 1920. Roseboro’ also published numerous short stories and articles in various magazines. Roseboro’ and Gertrude Hall Brownell (nicknamed Kitty) first met at an afternoon reception at the Barnard Club in New York City in 1900 and remained close friends and correspondents until Roseboro’s death in 1945 in Staten Island, NY. Gertrude Hall Brownell was a poet and author, born in Boston, Massachusetts in 1863. Hall Brownell married William Crary Brownell (AC 1871) in 1921 and died in 1961. The Gertrude Hall Brownell Collection of Viola Roseboro’ Correspondence can be accessed in the Amherst College Archives & Special Collections. Digitized copies of McClure’s Magazine are accessible online through Hathi Trust. Viola Roseboro’ obituary. New York Times, January 30, 1945. McClure, S.S. “My Autobiography” McClure Publications, 1913. One point I often make when talking with students about the books in the Archives & Special Collections is that printing is a capitalist enterprise. What I mean by that is that one must possess sufficient capital to purchase (or hire) a printing press with all of its equipment (e.g. type); then one must pay for the paper and the ink, the labor of setting type, the labor of operating the press, the warehouse space required to store your printed sheets, and so on before any profit can be made. If you want illustrations in your book, that would involve a completely separate process that requires its own specialized equipment and highly skilled labor, all of which requires funds. It’s especially important to bear in mind the financial underpinnings of print when we look back at the history of scientific publishing. Which gives me an excuse to talk about one of my very favorite books: The Moon: Considered as a Planet, a World, and a Satellite by James Nasmyth (London, 1874). Having made his fortune as an industrialist and inventor with his Bridgewater Foundry in Manchester, the mechanical engineer James Nasmyth was able to retire in his late forties, in 1856, in order to devote himself to his longstanding passion for astronomy (Nasmyth, Autobiography 329). His main astronomical project, from 1842, had been a sustained series of lunar observations, culminating in his publication The Moon: Considered as a Planet, a World, and a Satellite (Nasmyth and Carpenter). Among the reasons Nasmyth’s book is noteworthy is that it was one of the first books to be illustrated by photo-mechanical prints. Bearing in mind that this work was published in 1874, these couldn’t possibly be actual photographs of the lunar surface and the region around Vesuvius in Italy. Nasmyth had the means to pay for the construction of plaster of Paris models of lunar and terrestrial landscapes, then to pay for photographs of those landscapes, which were then published in his book to support his theories. Of course the lunar surface looks remarkably similar to Vesuvius — he built both of the models! While these photographs are beautiful to look at, it would be impossible to defend them as reliable scientific evidence of anything. But if you have sufficient funds to produce a lavishly illustrated book, you can make whatever claims you want. I like to imagine the less wealthy amateur astronomers who read Nasmyth’s book and disagreed, but did not have the same means of promoting their counter-arguments. Nasmyth’s use of a range of illustration techniques makes this work a wonderful specimen for the teaching of book history, but I wouldn’t rely on it for any information about the moon. All of these points are equally true of another nineteenth-century work in the Archives & Special Collections: Crania Americana; or, A Comparative View of the Skulls of Various Aboriginal Nations of North and South America: to which is Prefixed an Essay on the Varieties of the Human Species by Samuel George Morton (Philadelphia and London, 1839). Although it was published decades before Nasmyth’s work, these two works are very similar in their use of printing technology to advance a particular scientific theory — a theory that modern science has absolutely disproved. Morton lays out his methods and apparatus for measuring the hundreds of human skulls he had collected. Morton was a major contributor to what is now known as “scientific racism” — the claim that different groups of homo sapiens can be categorized and ranked based on “objective” scientific measurements. I will be posting more on this topic in the months ahead as we prepare an exhibition on the topic of the dissemination of scientific racism over the last 300 years and more. The thread that connects the two books in this post runs throughout scientific publishing — the factors of technology and funding have shaped the history of scientific communication almost as much as the data and field work on which these works are based. Native American poet, activist, and performer John Trudell died earlier this week. Obituaries and tributes can be found online in publications ranging from Indian Country Today to the New York Times. We have several works in the Archives & Special Collections by and about this remarkable man. 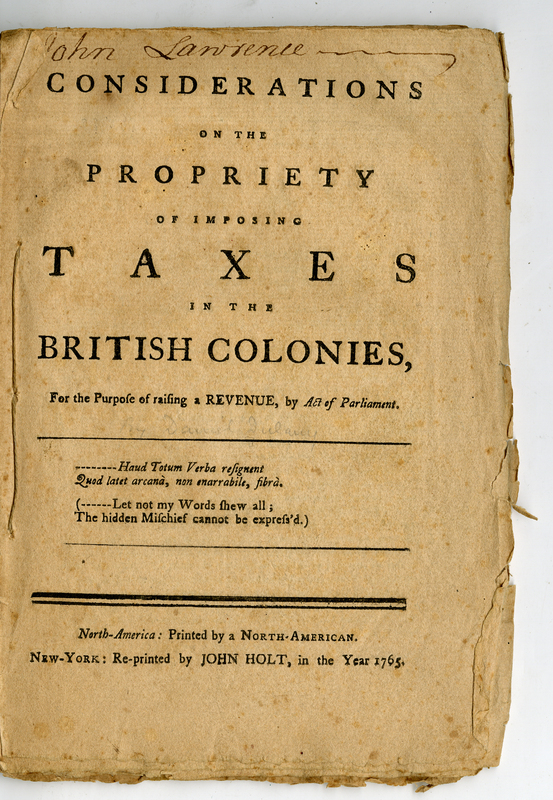 The title for this week’s blog is adapted from this 1780 pamphlet by Joseph Galloway, one of dozens of such publications available for use in the Archives & Special Collections. 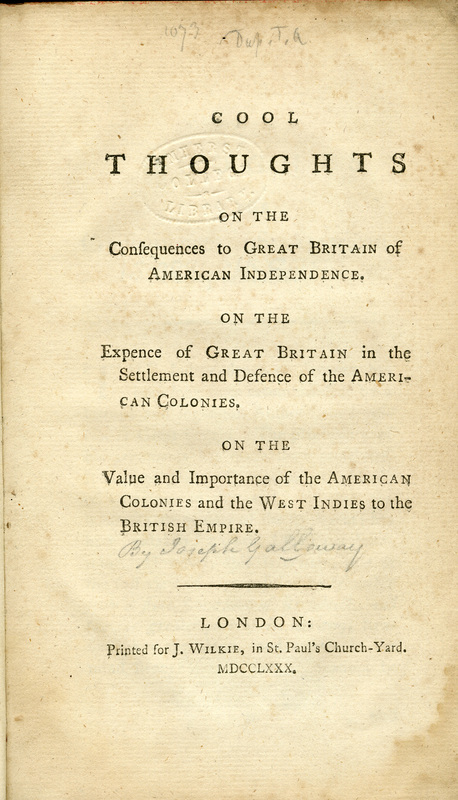 While we don’t claim anything like the comprehensive coverage of the published debates around the American Revolution available at places like the American Antiquarian Society, we do have a respectable teaching collection.